This is a delightfully dotty British crime caper in the spirit of The Lavender Hill Mob (1951) in which the residents of an elderly dowager's Kensington boarding house form an unlikely wild bunch, go on a spree and steal mink coats to give to charity. A retired major (Terry-Thomas), a neurotic china restorer (Elspeth Duxbury) and a burly etiquette tutor (Hattie Jacques) make up the latter day Merry Men under the auspices of Dame Beatrice Appleby (Athene Seyler) and the disapproving eye of her jailbird housekeeper (Billie Whitelaw, an actress best known for her work with Samuel Beckett and her role as evil governess Mrs. Baylock in The Omen, 1976), who just so happens to be dating a policeman (Jack Hedley). Make Mine Mink was directed by Robert Asher and produced by Hugh Stewart - the culprits behind many of Norman Wisdom's big screen outings - from Peter Coke's hit West End play Breath Of Spring (1958), adapted by Michael Pertwee and Peter Blackmore. As with many films of this period, Make Mine Mink is a beautifully shot document of post-war, pre-Swingin' Sixties London on the cusp of sexual revolution and features a wealth of cameos from the likes of Kenneth Williams, Irene Handl, Noel Purcell and even the late Clement Freud as a croupier. The slightly deranged central quartet make for an endearing surrogate family and it's touching watching these ageing oddballs rediscover their joie de vivre through a series of increasingly daring heists. Jacques in disguise as a voluptuous blonde is an extraordinary sight while T-T has fun reviving his dormant military instincts by re-enacting naval battles in the bath in the manner of Uncle Toby Shandy and gets to do a nice spoof of The Third Man (1949) when out searching for a prospective "fence" in a disreputable Docklands dive, unaware that it has recently been reformed by the Salvation Army. Everyone looks splendid in their Beefeater uniforms in the closing scene where the gang has a crack at the Crown Jewels, a fitting finale to a charming film. P.S. Here's a real find. 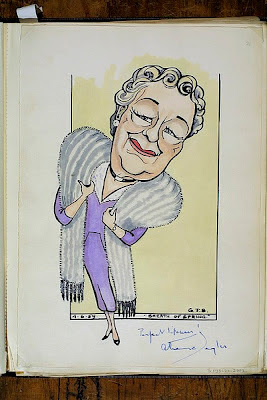 This caricature of Athene Seyler in character as Dame Beatrice was drawn while she was appearing in the original touring run of Breath Of Spring in Oxford in June 1959 by my very own great uncle, Gilbert Sommerlad (1904-76). Gilbert was an orchestral pianist and violinist who plied his trade at the Brighton Theatre Royal and then the Oxford New Theatre for over 40 years. He was also a talented cartoonist and spent much of his spare time in the theatre sketching the performers who appeared in the productions he accompanied, building up a collection of some of the biggest stars in British entertainment from the early Thirties to the mid-Sixties. His work features everyone from Sir John Gielgud to Lonnie Donegan by way of Frankie Howerd and the majority were autographed by their subjects, whom Gilbert, a great joker, frequently befriended. The complete portfolio of his sketches was donated to the Theatre Museum in 2002 and is now part of the Victoria & Albert collection. You can view it online in its entirety here.